Clearly I must be mad, in the past few weeks I have gone not once but twice to tile shops with the small fries in tow. Not to say my madness wasn't without method as I have finally picked our tiles! I have been to so many tile shops over the past 6 months I am a walking encyclopedia of where to find what in Perth and although I had a rough idea of what I wanted, it was harder than I thought to find it. 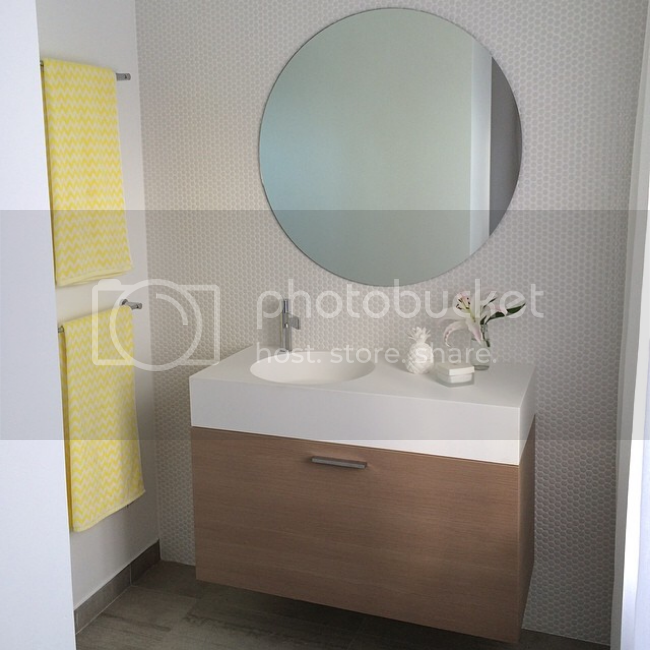 We really wanted to create a more grown up bathroom that still flowed nicely with the rest if the house so I wanted something that will look good against the polished concrete and wood veneer. These images have been in my inspiration file for some time. For the longest time I was set on having dark tiles on the walls and floor. The en-suite has only one small high window so I had assumed it would be a dark room and felt that we should go with it and go for that dark moody feel. It turns out our building designer knew what she was doing and that smallish north facing window actually lets in a lot more light than I had ever imagined. 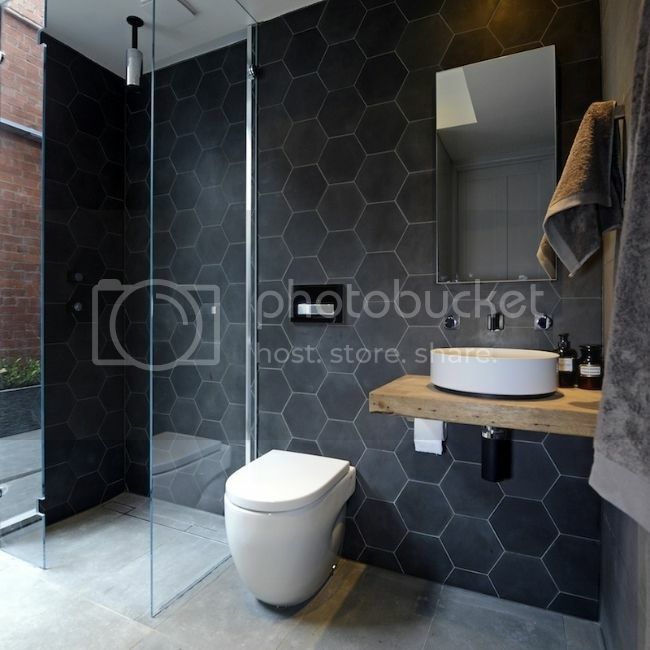 Still set on my original design plan for our dark moody bathroom I found some beautiful charcoal hexagons that so happened to be insanely expensive at over 250$ a square metre. 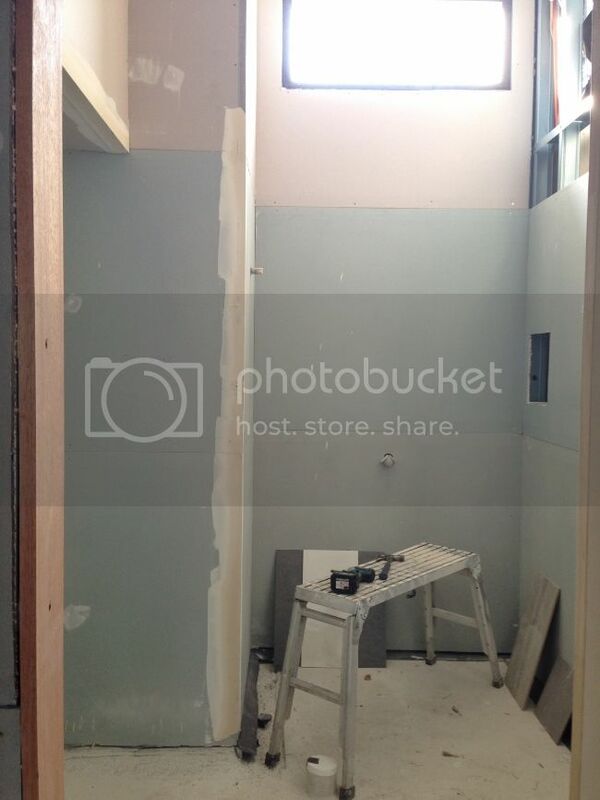 We are tiling up to 2.2mtrs so it was just not going to happen. 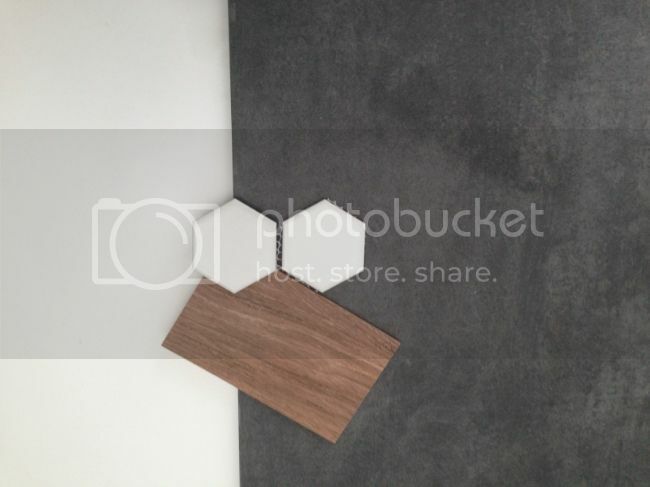 Matte rectified charcoal tiles for the floor, matte white rectified tiles for the main walls and matte white hexagons as a feature for the main shower wall and vanity wall. The wood sample hanging out right there will be our vanity top. ** I would also like to make a public statement that I have been looking at the matte type tiles long before the judges on the block said that Matte is what is "in" I'm just completely stylish and in the know (haha) Rectified tiles are more expensive to lay than traditional tiles as it is more complex but they just look so damn good I couldn't didn't want too compromise (sorry hubs)This week we have had some tilers come round to quote on the job so we should have someone to start in the next few weeks. We had planned on tiling ourselves to save some money but that went right out the window when I insisted on rectified tiles. Ultimately we would both rather bite the bullet and pay the pros to do the skilled jobs and get a perfect end result than DIY and be disappointed in the end.Just so I am not keeping you in the dark, here is a bit of an ugly photo of our new en-suite looking from the powder room back into the room. To the left under the bulk-head we will install a floating vanity and directly below the window is our shower which will be tiled with the hexagons. Thanks Sarah I am so happy with them, can't wait until they are laid now! I feel your pain tiles take the longest time to pick but you need to be really happy with them because they make such a statement. 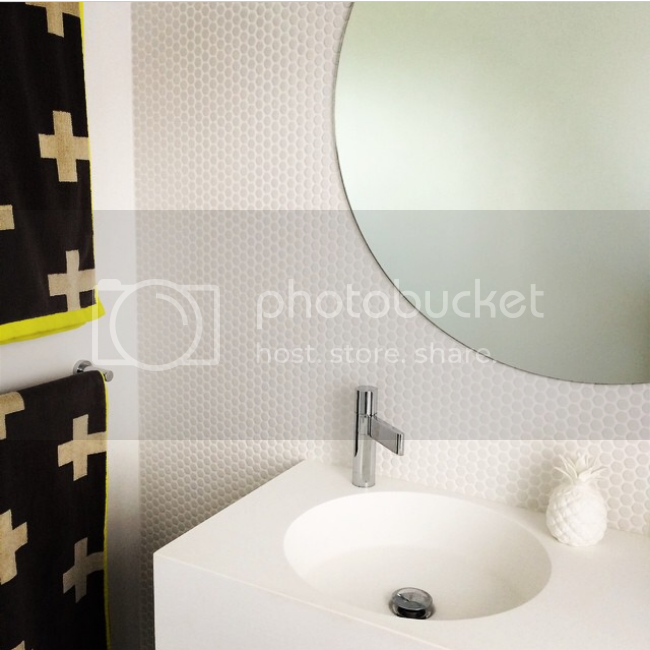 I love what youve picked especially the penny tile. My place is already done hehe. I don't mind it. 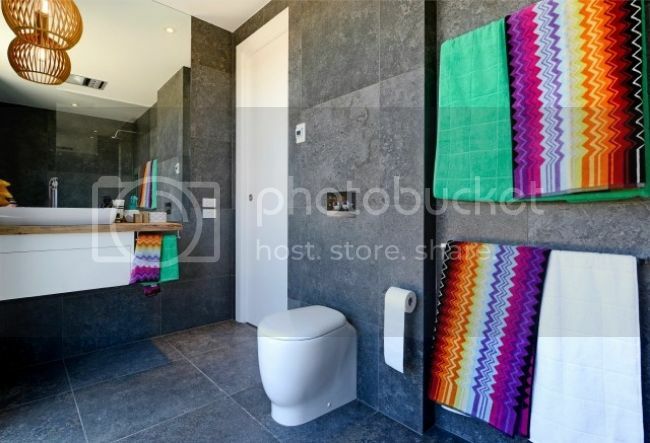 Builders just have so many rules like no large tiles or not unusual tiles. Or extreme prices. Just feature tile in my double shower was $450 for a strip as its not from builders range.